At some point in your life, it happens. 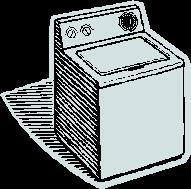 The washing machine stops spinning out or simply dies. What a major inconvenience to have wet and soapy clothes. You may have to go buy some underwear for the next couple of days or try to find a laundromat. It costs as much to repair as it does to buy a replacement. If you’re fortunate, you whip out the credit card on the weekend and try not to get sucked into your favorite color or cool front loader with the matching new dryer. Depending upon your stage in life, you may be forced to hit the garage sales and get a friend with a truck to pick one up. Regardless, the old washing machine is removed and the new one plugged in and screwed to the hot and cold water. You’re back in business and wash away without another thought until it happens again in another 6-8 years. The problem is that many companies take the same approach with their servers and it’s not as simple as replacing the washing machine. Anyone in business can tell you, there is significant risk and lots of small and massive failures. Owners have a lot of moving pieces to understand and must have the courage to make decisions like that old Kenny Rogers song – count your money, be ready for the cards you are dealt, and know when to walk away or run. These same people wouldn’t dare try to not pay payroll tax for a couple of months (which can never be escaped), but regularly risk it all to run 12 – 36 months out of warranty on servers running the business. You see I have a unique ability to tell the future about when a server will die. Well, actually it’s simple. Servers are generally warranted for 3 years with some limited options for upfront 4 or 5 years. That means there are no parts or extremely limited spare refurbished parts throughout the world at warranty end – thank you lean manufacturing. So that means if you have only one power supply that shorts out, it’s 5-10 business days to have a new server shipped plus emergency recovery because complex hardware and software just isn’t like plugging in a new washing machine. Bad RAM, that old type is probably not available. If you have RAID and one drive dies and the machine is still running, try 5 times the cost of a new one with 5 times the capacity wasted to replace. I’ve heard it all: “That’s the best server we ever bought” or “We just got that server in 2005”. This is generally begun or ended with some explicative or irrational statement about so much was spent, it should last for 20 years. Then, wait for it, the new equipment won’t run any of the old software and the new software requires other new software. Treating your infrastructure like a washing machine just costs the business half to a full month’s expenses and revenues, plus lost goodwill with employees, customers, and suppliers – along with bad press and loss of new potential sales. But its IT or that support firm’s fault right? We’ll just fire those bastards. After all, IT has no budget authority and those consultants were crazy and the recruiter of the day with PC Magazine says anybody can do this stuff. Ding. Ding. School is in. While it may feel good to fire someone in this situation, how about trying to prevent it in the future? Fact: your equipment is only as good as the warranty. Often it’s only like $200 – $400 more to get that 4 hour 4 year warranty part replacement from Dell. Then a hardware problem is fixed quickly versus doing everything by hand, waiting 10 business days for a new server and weeks to workout restoration with the waterfall effect of upgraded software. 1) Cloud Computing – Get rid of most of your servers. Escape the cost of hardware, software, maintenance, and upgrades. Along with less cost, a big chunk of your disaster recovery is also resolved. 2) Virtualization – What servers are left should be virtual with reduced equipment cost and the side benefit of running on older versions of software on the virtual servers longer. 3) Managed Services – You’ve outsourced everything from the coffee service to payroll because those services do it better and for less cost. Why not shrink or eliminate your IT staff for the same benefits? The good ones manage cloud computing and virtualization, as well as keeping you current for anything on-premise.